W. Robert Godfrey is president and professor of church history at Westminster Seminary California. He also serves as a teaching fellow for Ligonier Ministries and is a council member of the Alliance of Confessing Evangelicals. His many books include God’s Pattern for Creation, Pleasing God in Our Worship, and An Unexpected Journey. Scripture tells us that the church is the body of Christ, the entity through which God works to proclaim His gospel to the world. In our day, this magnificent calling for the church is often neglected, and the good news of the gospel is exchanged for a sales pitch that fills seats at the expense of the clear preaching of the one message that can save us from sin and darkness. Dr. Godfrey will show how the church is a community brought into being by the living God for the purpose of bringing His light to the nations, and He will beseech the Lord to revive us from a low view of the church. The Word of God is living and active, the lamp for our feet that not only guides us in righteousness, but also creates new life in fallen people as the Holy Spirit brings it to bear on our darkened hearts. We are pressured, however, to downplay Scripture as the inspired and inerrant Word of God, and to treat it as a helpful moral guide that is just one book among many. 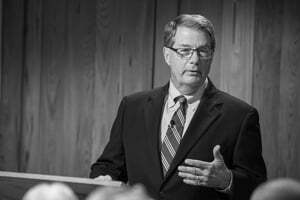 Dr. Godfrey will look at the power of God’s Word to overcome the darkness, and he will call upon God to move us from a low view of Scripture to a high view that understands that the Bible is entirely trustworthy and alone provides the message of salvation. You can find all of Dr. Godfrey’s past conference messages here, but below is his message titled, “Against the World” from our 2014 National Conference. In this message, he reflects on the experience of Athanasius and affirms the calling of Christians to stand against the world, explaining that we will have trouble in this world, and reminds us of the importance of standing firm against attacks on the person and work of Christ. Steven Lawson is president of OnePassion Ministries, which aims to bring about biblical reformation in the church today, and former senior pastor of Christ Fellowship Baptist Church in Mobile, Ala. A frequent conference speaker, Dr. Lawson is a Ligonier teaching fellow and author of nearly two dozen books, including The Daring Mission of William Tyndale and Pillars of Grace. If the church has a low view of God, its light will be dim, and the darkness will not be pushed back. Today, our concept of God is often sentimental rather than biblically based. Many people embrace what has been called “moralistic therapeutic deism,” a view of God that says He exists to make us feel good about ourselves, and that He involves Himself in our lives only to affirm us and solve our problems. As long as we do not properly grasp the transcendent majesty and holiness of God, our light will not pierce the darkness. 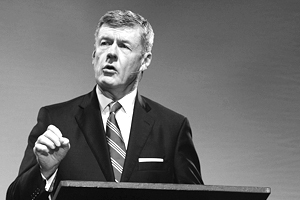 Dr. Steven J. Lawson will proclaim the centrality of a high, biblical view of the Lord, calling upon God to restore the truth about His transcendent majesty and holiness in His church. You can find all of Dr. Lawson’s past conference messages here, but below is his message titled, “Blessing and Curse” from last year’s Regional Conference in Philadelphia. In this message he explains the meaning of blessing and cursing from a biblical perspective, and what it meant for Christ to bear the curse of God (Gal. 3:13). Please consider joining us for this conference in February. We hope to see you among the thousands already registered who will gather in Orlando for teaching, worship, prayer, and fellowship. Register today and save $20.